If you are moving to a new web hosting service provider then you must read this blog post. There are myriad reasons why businesses move from their existing web hosting service to a new one. While some businesses say that the reason for migration is low disk space, others show different other reasons including frequent breakdowns, poor quality of customer service, and many more. No matter when you make the move, it always seems an overwhelming task. However, it is not that overwhelming, in reality, as it may seem. 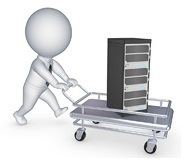 This blog post will point out why web host migration is not that much of a huge task. What to consider while choosing a new web hosting solution provider? 1. Which type of operating system (OS) are you using? No matter when you make the move from one web hosting service provider to another, it is always better to choose the operating system that you are using currently. In case, you are currently using a Windows OS then at the time of migrating to a new service provider keep the OS same. This will make the process of migration easier. However, if there are some compulsions on your part or any specific reason for changing the operating system then first check whether the service provider you are planning to move to offers your preferred OS or not. There are many cases where users need MySQL hosting specifically because of the simple fact that their website needs MySQL. In that case it must be clearly understood that MySQL or Access work only with Windows OS. Hence, keep all these aspects in mind while planning to migrate to a new web hosting service provider. 2. What kinds of bandwidth and disk space are you looking for? Bandwidth as well as disk space are the two basic requirements for which most business users change their hosting service provider. When you select a new hosting solution it is very important to inquire about their provided disk space as well as bandwidth because of the simple fact that the former provides you the storage space for your data as well as applications and the latter provides you speed. Now, you need to check whether the new service provider will provide more disk space as well as bandwidth and that’s too at the same cost. If the new service provider doesn’t provide that you are advised to carry on a cost-benefit analysis on both the service providers. Once you do this analysis it becomes easier for you to come to a decision. 3. What’s the Network Uptime? This is important information for you to collect because of the simple fact that on the basis of this factor credibility of your site is dependent upon. No one likes a site to be down. This fact directly affects the visitors or customers of your website. They will let them get annoyed and may never again click the site or return. This means that consistent downtime will make your visitors or customers leave you forever. If it is calculated in monetary terms it can be said that you may end up losing hundreds and thousands of dollars or rupees if your network uptime is poor. Always try to find out a new web hosting service provider that provides you with network uptime above 99.95%. However, there are many service providers who will try to allure you by providing 100% uptime guarantee assurance. However, this is less likely to be true. Hence, it will be best for you to verify the claims. It is also important to check whether the service provider goes for scheduled maintenance during non-peak hours or peak hours. It is always desirable that they provide the scheduled maintenance during non-peak hours because this work at peak hours translates to substantial loss in web traffic as well as revenue for your business. These are the three basic things that you need to consider while migrating to a new web hosting service provider.